New Executive Chef Marc Johnson Takes Over the Kitchen at Tipple & Brine! Sherman Oaks, CA: Coming up on one year this April, Tipple & Brine’s eponymous combination of craft cocktails and oysters (along with fresh and sustainable seafood of all kinds) has been getting lots of attention. And now the Downtown Sherman Oaks hot spot is taking its next step in shaking up the local food scene by introducing new Executive Chef Marc Johnson! Chef Johnson, a Los Angeles native, graduated from the California Culinary Academy in San Francisco in 2001 and has been making his mark on the Southern California food scene ever since. 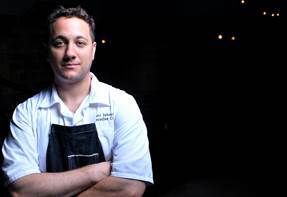 Some of his previous culinary homes include the Lincoln Steakhouse in Santa Monica, the Avalon Hotel and La Seine in Beverly Hills, the now closed Culver City favorite Waterloo & City under Executive Chef Brendan Collins, Haven Gastropub in Pasadena with Owner and Executive Chef Greg Daniels, and West Hollywood’s STK. In 2013 Johnson was named Executive Chef at Hollywood’s mainstay Wood & Vine, where he focused on creating a rustic modern menu that allowed guests to choose from a selection of unique bites and shareable plates, then launched a successful and delicious weekend brunch, while making his mark with signature dishes that call upon his personal culinary philosophies. Experimenting in the kitchen is really in Johnson’s blood: With a working mom growing up in La Cañada, he would come home from school and “just start making things with whatever was in the fridge,” he says. The cooking bug stuck, and when his best grades in high school were in his ‘Foods’ class, Johnson knew culinary school was calling his name. Johnson will not be making any drastic changes to the Tipple & Brine menu off the bat; customer favorites like the Crispy Oysters and Sea Urchin Toast with Avocado Mousse will not be going anywhere. “We are just fine-tuning everything,” he says. “The menu is still the same concept, still seafood-forward; I am just going to elevate that some.” Diners can expect to see more original creations from the new Chef coming in April 2015, when Tipple & Brine will celebrate its one-year anniversary and release an all-new spring menu. “We are off to a great start,” says Tipple & Brine Principal Richard DiSisto. “Chef Marc brings incredible talent and sophistication to our team, and his skill, knowledge and overall humble demeanor perfectly complement our Vantage Restaurant Group philosophy.” In addition to serving as Executive Chef at Tipple & Brine, Johnson will also be taking on all Executive Chef responsibilities for DiSisto’s Vantage Restaurant Group, helping to plot the culinary path of future projects for the veteran restaurateur as well. Whether you are looking for a quick after work cocktail and a half dozen oysters or you are looking for a tasty spot for a date night feast, Tipple & Brine is the place for you. With Executive Chef Marc Johnson taking the helm in the kitchen, there are new and exciting tastes for everyone to explore and enjoy! Tipple & Brine is open Sunday through Wednesday from 4:30 pm to midnight, and Thursday through Saturday from 4:30 pm to 1:00 am. For more information or reservations, please visit www.tippleandbrine.com, or call Tipple & Brine directly at 818.528.2550.